Motor vehicle accidents can leave people struggling with life-changing injuries. 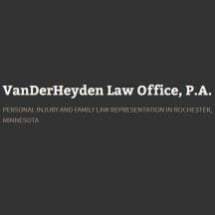 At VanDerHeyden Law Office, P.A., we offer dedicated representation to clients throughout the Rochester, Minnesota, area who have suffered injuries due to the negligence or recklessness of others. Our attorneys understand that people may be concerned about loss of income, mounting medical debt and meeting their financial obligations. Aggressively advocating on their behalf, we strive to help those we represent achieve financial justice. Since 1980, our team has been committed to helping people recover just compensation for the losses they suffer as a result of injury accidents. We have obtained positive results on behalf of clients in cases involving issues such as car and truck accidents, slips and falls, dog bites, farm accidents and brain injuries. Beyond aiding clients with personal injury claims, our attorneys at VanDerHeyden Law Office, P.A., are also able to represent people in family law cases. Whether going through a divorce, dealing with property division, or seeking custody or parenting time, we offer compassionate counsel and tireless advocacy. We work to help our clients favorably resolve their legal issues, so they and their families can move forward. We begin our journey for our clients with a free initial consultation. At that time, we listen to them and gain an understanding of their situations and needs. Providing customized guidance, our law office works with those we represent to craft strategies based on their specific circumstances and legal objectives. Throughout each stage of the process, our attorneys are focused on our clients' best interests, and we work to protect their rights.